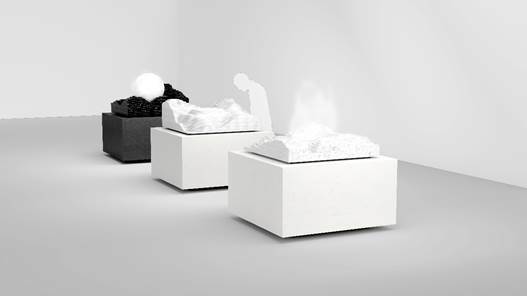 Leading quartz manufacturer Caesarstone is unveiling Altered States, the first instalment of its 2018 collaboration with New York based collaborative practice, Snarkitecture, at Toronto’s upcoming Interior Design Show (IDS), held from January 18 to 21. Since 2013, Caesarstone has collaborated with some of the world’s leading designers including nendo, Raw Edges, Philippe Malouin, Tom Dixon and Jaime Hayon. The 2018 collaboration will focus on the icon of the modern home, the kitchen island. Over the past 40 years the kitchen has transformed from the private, utilitarian space to the most public space in the home. It has evolved into a place for entertainment, social interaction and performances where we demonstrate our ‘professional’ cooking skills, as well as showcase our high-tech appliances. With water being one of the most important ingredients in the kitchen, one that is used for a wide variety of cooking techniques and culinary creations, the Altered States installation explores water’s ‘changing states’ in the context of the kitchen island, as well as in nature (glacier, river, geyser). Titled Ice Island, Water Island, Steam Island and Play Island, the kitchen islands’ defining characteristics -technology, performance, hosting, entertainment and the kitchen island’s central role in the home – are incorporated into the installation. Using Caesarstone as the starting point of their creative exercise, Snarkitecture transforms Caesarstone surfaces into sinuous, stratified layers that visually emulate natural topography, the key source of inspiration for the overall design language. “The theme of the kitchen island resonated with us from the very beginning because of the understanding that the kitchen is the social hub of the house. This idea aligns with Snarkitecture’s goal of creating environments and experiences that are designed to be inclusive.”Alex Mustonen, Partner and co-founder at Snarkitecture.